BattleReport: High Elves vs. Beasts of Chaos Siege! Yllyriel paced the castle walls, his delicate mail armour cold against his skin in the chill of dawn. The Sun was just beginning to crest the mountain range behind the castle throwing long, but progressively shortening shadows into the castle and across the plain beyond as it rose higher into the sky. A light mist lay on the plain and as the sunlight hit it, Yllyriel could see it boil away. As the shadows receeded and the mist lifted, the forest beyond the plain came clearer into view. Dawn was always his favourite time to be on sentry duty. Landrien, the other sentry on this section of wall approached him. "We are blessed with another beautiful day, Yllyriel!" he said. They stood together for a time, drinking in the view. They were about to part to continue their patrols when the sound from a brash, loud horn assaulted their ears. No Elven horn, that! It had a cracked, discordant tone which was chilling to the ear. "Where did that come from?" asked Landrien. He'd barely finished speaking when another horn sounded, this one clearly from their left. A third horn blarted out, pitched lower than the first and louder - closer? - than the second. Yllyriel saw them then - spilling from the forest. Beastmen! Equipped for an assault. Battering Rams, Siege Towers. The filthy creatures were attacking. Yllyriel cried, "Alarm! Alarm! We are attacked!" Landrien pulled his own horn from his belt. As he raised it to his lips, another horn - definately Elven - sounded. Sentries from other parts of the castle had seen it too. He joined his horn's call with theirs and others joined them in quick succession. Not the dirty, broken, blatting of the Beasts horns, these, but clear tones; pure and strong. The High Elf garrison readied itself for battle as the Beasts of Chaos advanced on the walls. They were besieged! 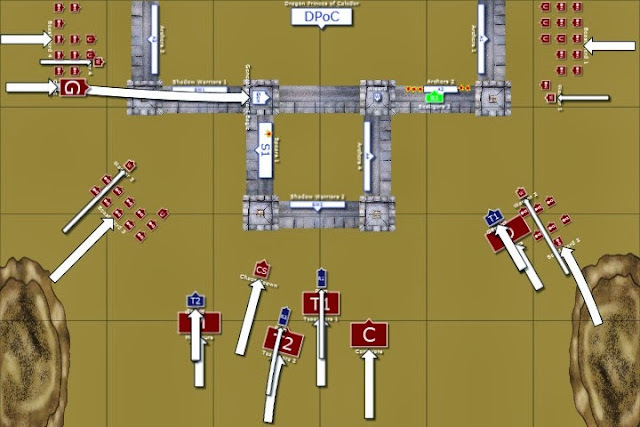 This was a Siege game played using Warhammer 7th Edition core rules and the Siege Scenario from the Warhammer 6th Edition rulebook (Games Workshop haven't been kind enough to maintain their Siege Rules from one release to the next, so compromises have to be made). 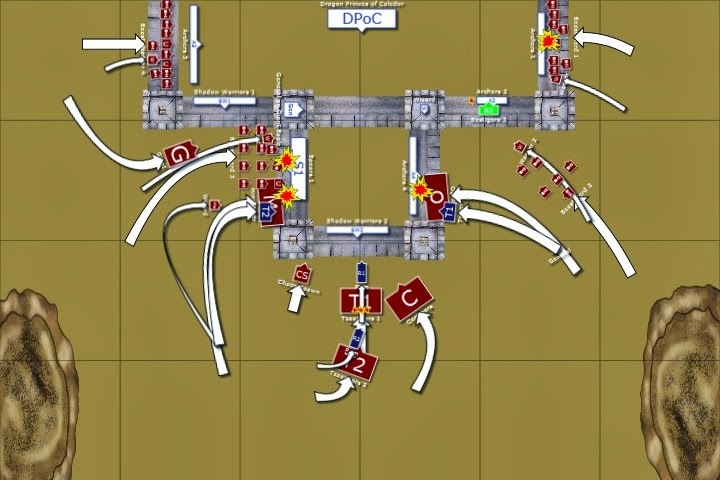 There are differences in some of the core rules between the two editions, notably for this game in the "Attacking across a defended obstacle" rule. We decided that we would play with the "stiffer" of the two rules - that from the 6th Ed. book which required a roll of a natural "6" to hit. We also decided that - to make life not impossible for the attackers - to allow them to use hand-weapon and shield as normal (even though in real life climbing a grappling hook rope would make that impossible). This was our first attempt at playing a Siege using these rules and as such the game should be considered "experimental". It was also Mike's first outing as a High Elf General so his army list was completely untried in the field, whereas I'd played the Beasts once before and knew them to be a formidable close combat force. Composition: Core Hand Weapon; Shield. Ungors have spears. The game was played on a 6' x 4' table. We'd mulled over a number of layouts for the castle and the one we favoured was, in all truth, slightly too large for the table. According to the deployment rules, the attackers can't be set up within 24'' of the castle. We couldn't achieve that on this table so instead the Beasts (which typically have a 5'' move and therefore a 5'' march move) set up within 14'' of the castle (where they would have got to after one turn of movement). 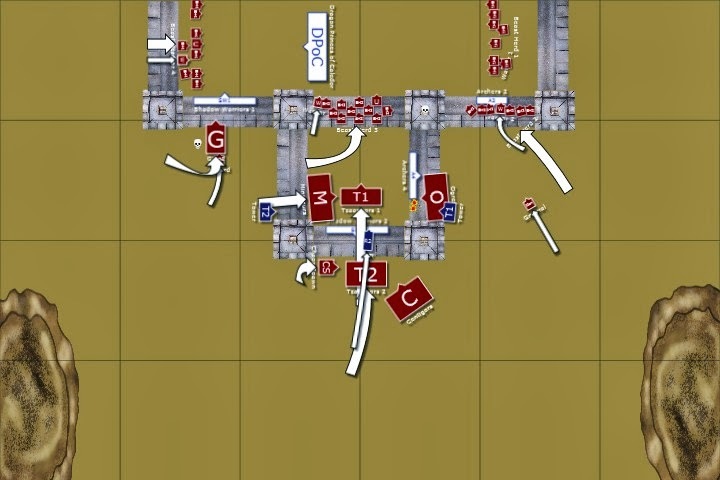 Turn one was played without movement - just shooting and magic at an assumed range of 24''. That dealt quite nicely with the smaller-than-ideal table. The castle was built on the "North" table edge allowing the Beasts to deply on the South edge and also the East and West flanks. The High Elf General was mounted on a Giant Eagle. High Elf Units "Archers 3" and "Archers 3" were equipped with cauldrons of Boiling Oil. High Elf Unit "Shadow Warriors 2" was equipped with Throwing Rocks. The wall section they were positioned on was the Castle Gate, and the wall section north and parallel to it contained another Gate. Beasts unit "Ogres" were equipped with a Siege Tower, inside which the Army General was deployed. Beasts unit "Minotaurs" were equipped with a Siege Tower, inside which the Wizard (Great Bray Shaman) was deployed. Beasts units "Tzaangors 1" and "Tzaangors 2" were equipped with Battering Rams. The High Elf L2 Wizard rolled "Fury of Khaine" and "Shield of Sephery". In addition, he gets "Drain Magic" for free. The Beasts General (Level 4 Tzeentch Wizard), rolled "Yellow Fire of Transmutation", "Green Fire of Mutation", "Blue Fire of Metamorphosis" and "Indigo Fire of Change". The Beasts Great Bray Shaman (Level 4) rolled "The Bear's Anger", "The Crow's Feast", "The Beast Cowers" and "The Hunters Spear". No movement took place in Turn 1 - the Elves stayed put as deployed and as it was assumed that turn would be used getting to the point on the table where the Beasts deployed (see Deployment Notes - this was to overcome the problem of the small table) they didn't move either. The Elf Wizard cast "Drain Magic", but it was dispelled by the Beasts. Elf unit "Archers 1" shot at "Beast Herd 1" causing three hits, but no wounds. Elf unit "Archers 2" shot at "Beast Herd 2" killing two Ungors. Elf unit "Shadow Warriors 2" shot at "Tzaangors 1" but failed to do any damage. Elf unit "Shadow Warriors 2" shot at "Beast Herd 3" killing one Ungor. Elf unit "Archers 3" shot at "Beast Herd 4" killing one Ungor. First blood to the Elves! The Beast General irrevocably cast "Yellow Fire..." on himself giving himself and the accompanying Ogres a Ward save. All other spells were out of range and the Beasts have no ranged weapons, so that was it for them! The High Elf General takes to the skies on his mighty Giant Eagle and charges the Chaos Giant. His bravado is short-lived, however, as he fails his "Terror!" roll and flees back to his eyrie on the Castle tower. "Beast Herd 2" takes a pounding from High Elf Magic and archery, losing three Ungors and one Gor to the Elf Mage's "Fury of Khaine" spell and then two more Gors thanks to "Archers 2"'s pinpoint shooting. "Archers 6" were less fortunate, failing to cause any wounds. "Archers 1" killed two Ungors in "Beast Herd 1" and not to be outdone, "Shadow Warriors 2" killed 3 Ungors from "Beast Herd 3". The punishment doesn't stop there - "Archers 3" pound "Beast Herd 4" with arrows killing two Ungors and one Gor. There the fortunes of the High Elf Archers fail: "Shadow Warriors 2" fail to score any wounds on "Tzaangors 1" and "Archers 4" fail to inflict further punishment on the beleaguered "Beast Herd 2". The Beasts advance! All units move up to their fullest extent. Having no missiles, the only possibility for the Beasts to do any harm is with Magic. Magic is, however, something the Beasts bring in vast quantity. The General casts "Green Fire..." on "Archers 2", killing three Elves. He then casts "Indigo Fire..." on the same unit. Wracked with Magical forces, two of the Elves in the unit are transformed into Tzaangors! The Beast's Great Bray Shaman casts "Hunter's Spear" at "Spears 1" but it is dispelled by the High Elf Mage. He gathers his magic again and hurls "The Crows Feast" at the Spearmen, killing one. The High Elf General gathers himself and rallies - he spends the remainder of the turn reforming. The High Elf Wizard has an unfortunate rounds - he attempts to bolster "Archers 2" with "Shield of Sephery" but fails. He then tries to debilitate the Beasts magical abilities with his innate "Drain Magic" spell, but his attempt is Dispelled. The High Elf archers fare no better in what turns out to be a disastrous turn - all their shooting fails apart from "Archers 4" who manage to kill one more Ungor from Beast Herd 2. The Beast Herds' skirmish formation and high Toughness are ruining what is normally devastating missile fire from the Elves. 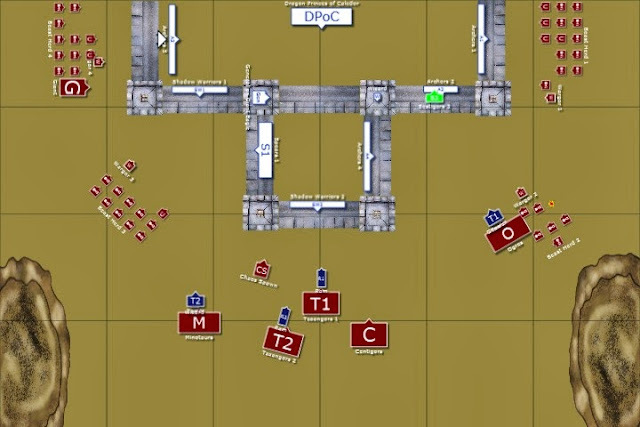 In close combat "Archers 2", who were effectively charged by new unit "Bestigors 3" defend themselves admirably - the combat is drawn with no casualties on either side. The Beast General dismounts the Siege Tower now that he's in easy spell-casting range of the castle and casts "Green Fire..." at the High Elf Mage, causing 1 Wound. Determined to press home the advantage, he also casts "Indigo Fire..." but the plucky Elven Mage Dispels the torrent of filthy Chaos Magic, even whilst still reeling from the damage caused by the first spell. The Great Bray Shaman also dismounts his Siege Tower but has a less successful round: he casts "The Crows Feast" at the Elven General but causes no damage then goes on to cast "The Hunter's Spear" at the Elven General, which is Dispelled. Muttering crossly to himself, he casts "The Bear's Anger" on "Beast Herd 3" to give them an advantage in close combat. close combat. The Beasts retaliate by killing two Archers. 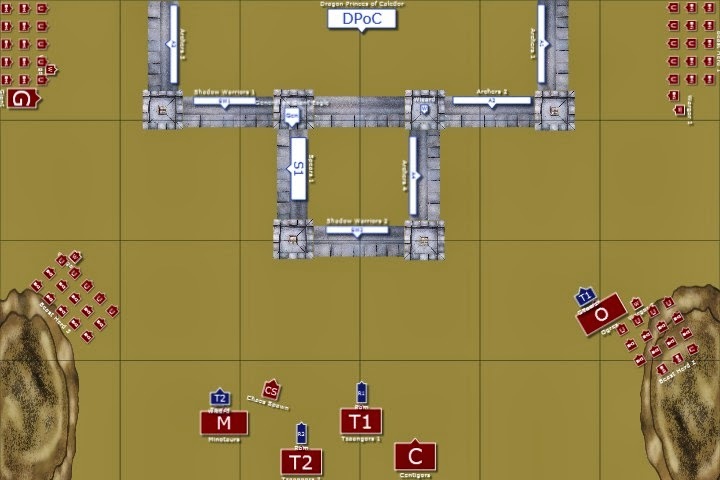 "Beast Herd 2" moves closer to the castle in order to be able to assault next turn. "Beast Herd 3" Assaults "Spears 1" alongside the Minotaurs who spew roaring from their Siege Tower. In a shockingly poor round of combat, the magically augmented Herd and the Minotaurs fail to cause any wounds at all on the High Elf Spearmen. One Minotaur is wounded in return. The combat is a stand-off! 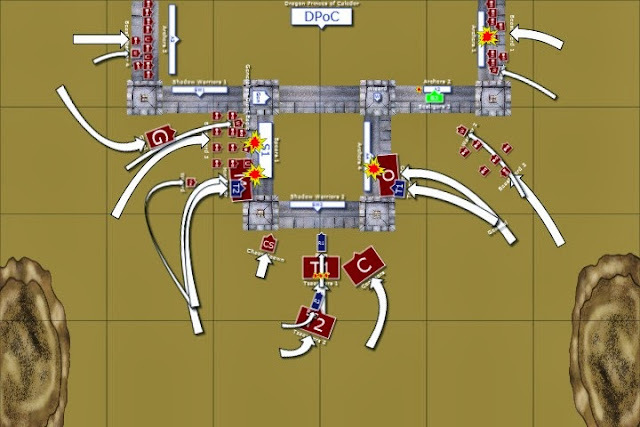 "Beast Herd 4" climb the undefended walls that "Archers 3" fled from. "Tzaangors 1" assault the gates with their Battering Ram. They damage the gate, weakening it, but loas 3 of their number due to thrown rocks in the process. On the ramparts, the magically created unit of Bestigors "Bestigors 3" kills one Archer from unit "Archers 2", but as the Archers outnumber the Bestigors the combat is drawn. High Elf unit "Archers 4" fail to rally and flee from the table. The Elven Wizard casts "Fury of Khaine" on the Beast General, but he Dispels the spell easily. The Elf General decides to deal with his own fears and to tackle the "Big Scary" on the table - he assaults the Giant. Again. This time, the Terror! test is passed. The General fails to Wound the Giant, but his Eagle causes one Wound. Peeved, the Giant does a "Thump with club" attack on the Eagle and kills it. The General dismounts and readies to deal with the Giant on foot in a proper "David and Goliath" scrap. The "Dragon Princes", spying the Beasts climbing over the walls turn, ready to face their foe. "Shadow Warriors 1" turn to face "Beast Herd 4" and loose a volley of arrow, killing a Gor and an Ungor. "Shadow Warriors 2" continue to rain rocks on the Tzaangors attacking the gate, killing three more of them. The Tzaangors do not Panic! Things get very bloody on the far right wall. The assault goes the way of the Beasts - four Elves are killed in unit "Archers 1" who Flee! and are Pursued into the courtyard, caught and killed. "Archers 2" have mettle! They lay about the "Bestigor 3" unit and slay the two Bestigors who used to be members of their own unit! 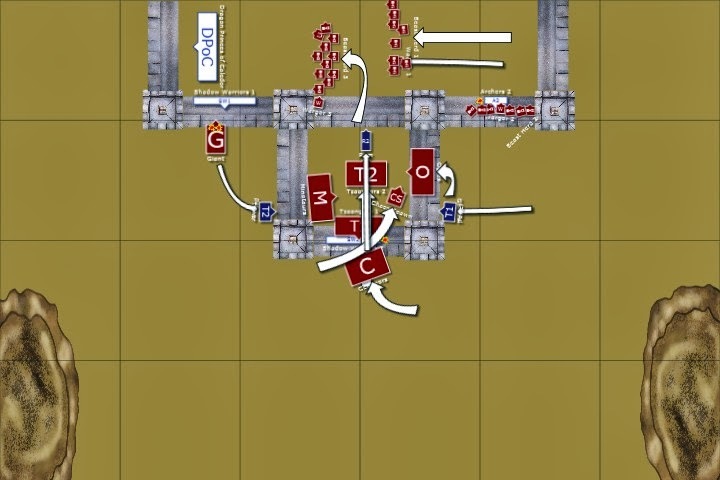 These Elven Archers are made of stern stuff: "Archers 4" trade blows with the assaulting Ogres losing two of their own number but holding the walls as they badly wound one of the Ogres. Outside the castle, "Tzaangors 1" swing their Ram gain at the gate, shattering it! They discard the Ram and make ready to enter the courtyard., leaving their kin in "Tzaangors 2" to bring up the next Ram to tackle the inner-courtyard's gate. The courtyard is becoming a busy place. "Spears 1" have a poor round, doing no Wounds against the attacking forces. The Wargor with "Beast Herd 3" kills three Elves. His Herd kill another one, and a Minotaur kills a fifth. The Elves break, Flee! but are pursued by "Beast Herd 3" and caught and killed. The Beast General advances toward the Elf Mage and casts "Blue Fire..." - the Elf Wizard dies, wracked with pain. Beasts magic falters, however as the Beast Wizard hurls spells at "Shadow Warriors 1" which all either fail or are Dispelled. "Beast Herd 1" advances towards the "Dragon Princes" readying themselves to charge. "Beast Herd 2" assaults the walls, allowing no respite for "Archers 2". 1 Gor is killed in the assault and the Wargor kills two Archers, but the Elves are strong of spirit and hold fast! "Beast Herd 3" along with their Wargor leader climb the gated wall and ready to assault into the large courtyard. "Beast Herd 4" move into the courtyard, readying themselves for a fight with the "Dragon Princes" which "Beast Herds 1 & 3" are both also planning to join. The minotaurs move off the walls and into the courtyard. Unless the inner gate comes down, they will be trapped here as they can't scale walls (no ladders or grapples) and they can't move through the towers due to their size. Two more Elves fall to the Ogres, but they show their bravery and continue to hold. 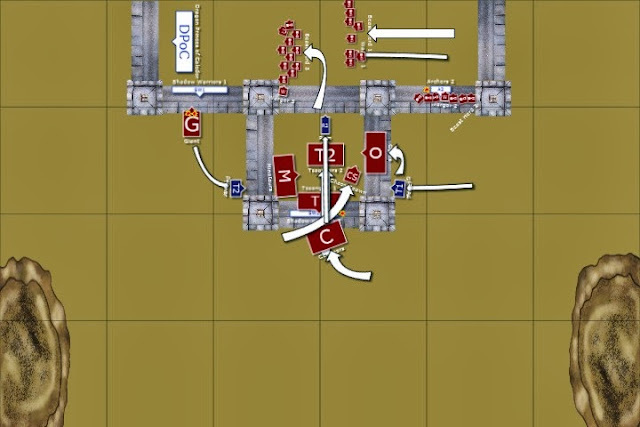 "Tzaangors 1" move through the gate and into the small courtyard with their kin in "Tzaangors 2" close on their heels with their Battering Ram. The Chaos Giant trades blows with the High Elf General and kills him. The Centigors hold position as the gate is too crowded. "Dragon Princes..." charge "Beast Herd 4" - 6 Gors are killed in the charge, one Elf dies. The Beasts Break, Flee! and are cut down. "Shadow Warriors 2" turn to follow "Tzaangors 1" as they progress into the courtyard and drop more rocks on them as they pass through the gate. Their aim is off, however and they cause no wounds. On the walls, the combats continue as the Elves keep up their valiant defence. "Archers 2" hold their wall with no losses on either side, whilst in the battle against the Ogres, "Archers 4" lose a man but continue to hold their position. Despite having a Terror! causing Chaos Giant bearing down on them, "Shadow Warriors 1" turn to engage the Giant and cause 2 Wounds on him! The Giant tries a bit of lateral thinking - take out the wall. Unfortunately, using his head is not his strong point as he discovers after head-butting the wall, causing it no damage. The Beast General and Wizard re-enter their Siege Towers as a way of gaining access to the castle. "Beast Herd 1" March on the "Dragon Princes..."
"Tzaangors 1" finally lose their patience with "Shadow Warriors 2" and engage them on the walls. One Elf is killed, and the Elves hold fast. 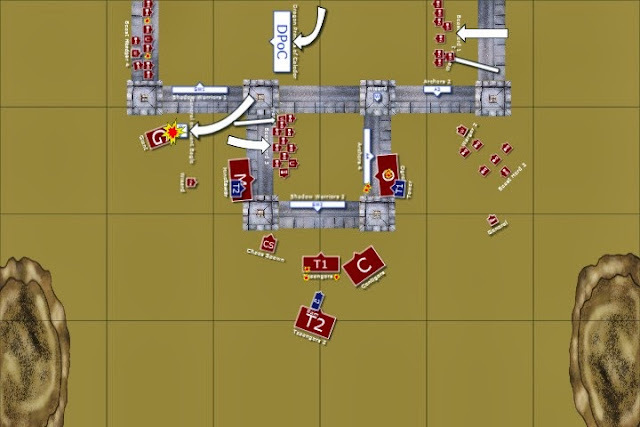 "Tzaangors 2" advance on the inner gate with their Battering Ram. "Beast Herd 3" descends the wall, ready to take on the "Dragon Princes..."
The Spawn advances into the courtyard, followed by the Centigors. "Beast Herd 2" kill another Elf, but the Elves continue to hold their wall. Indomitable or what! In a precise repeat of the previous turn, "Shadow Warriors 1" cause a further 2 Wounds on the Giant who again (probably concussed from the previous attempt) head-butts the wall, causing it no damage. The Ogres finally put paid to the remaining members of "Archers 4" and consolidate onto the walls. The game was cut short at that point. 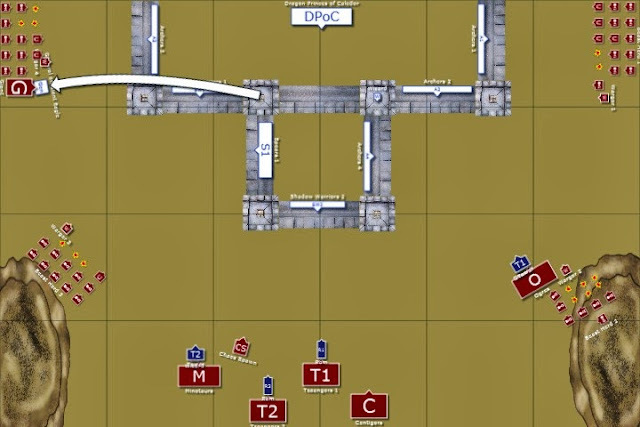 A Siege, according to the 6th Edition Siege Scenario, should last a fixed turn count of seven turns. We were forced to end the game at the end of turn 5 as time was running short and I'd got a situation that I needed to assist with at home. That said, it was becoming a bit of a grinder anyway - the walls had been carried and it was only a matter of time before the High Elves were completely destroyed. The High Elf Cavalry unit in the main castle square was pretty much the only unit left and - whilst it was a powerful unit which had already destroyed a Beast Herd - it was quite simply outnumbered to a vast degree. The Bestigors should have battered the gate down leaving the inner courtyard open to them, the Ogres and the Minotaurs. It was, I think, only a matter of time. Victory to the Beasts of Chaos! So, another victory for Dean! Well, I have to say, for the scenery alone, Dean deserved a win. The Castle, siege equipment and his army were all top notch and a joy to photograph. So what happened? The Elven archery was not decisive enough. I kept shooting the soft targets of the skirmishers which were hard to hit. The Towers and Giant really needed some punch - probably a bolt thrower or two. The Giant was awesome as it couldn't hit much at all apart from the Elf General and his Eagle. what he did do was cause Terror. If I could rewind the game, bringing down the Giant with bowfire would have been the key to helping save the right flank of the table. I should have worried less about the Beastmen getting into the back of the Castle as the Elf Cavalry clearly had the advantage in the back field. 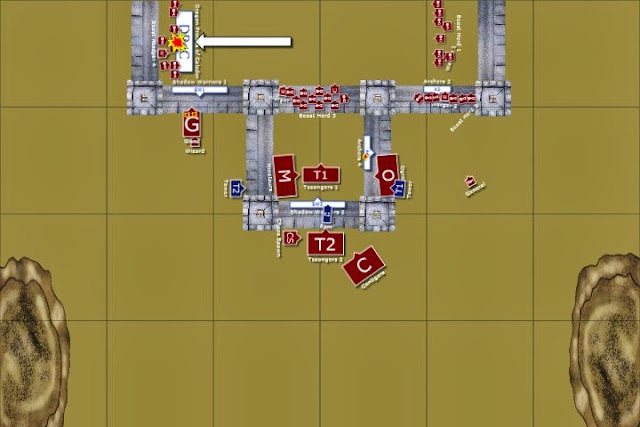 The next problem was how to stop the Siege Towers and Rams. I couldn't take down enough of the Beastmen with the Ram before they reached the gates. More firepower would have been good here. The rocks were OK, better than Elf archery really! Once the Siege Towers made it, the Elves were never going to stand up to that onslaught. T3 troops are fragile. The only thing going for the Elves was their Always Strikes First. It was always going to be a war of attrition, I just needed to slow down the Beasts until turn 7, hopefully denying them a win. A couple more turns and the game would have ended perhaps without a clear winner. As it was, the Elves held only one section out of four and lost the game. I think the Elf list was too frivolous and fragile. The Eagle and Hero did nothing. At 1500 points I couldn't take an Elf Mage Lord to balance up the magic. Having been beaten on magic, I even saw some of my elves turned into Beastmen on my own ramparts. Yuk. I very much enjoyed the game - I always enjoy wargaming and it was great to catch up with Mike - we don't get together nearly often enough. That said, I'm not really sure, in retrospect, about the Siege Rules. Looking back on it the game felt imbalanced in my favour. According to the Scenario the defending player gets 1500pts and the attacker gets 3000pts. That allowed me to lay in a large force with some heavy units (Ogres, Minotaurs), plenty of Siege kit (Towers, Rams, grapples), a Giant and - most importantly on the day - loads of characters. Each Beast Herd had a "Hero" to lead it and there were two "Lord" characters. Sounds heavy enough until you realise that one Lord had the Mark of Tzeentch (making him a level 4 wizard) and the other *was* a Level 4 wizard. To add insult to injury I had enough points to equip a number of my units with the Mark of Tzeentch, each of which gave me an additional Power Dice. What all that meant was that I could lay out a devastating amount of Magic every turn, knocking holes in Mike's units and turning his units on themselves with some horrible spells. Mike just didn't have the points to spend to defend against that sort of thing. In addition to that little lot, I don't think it was hard enough to scale the walls. It should be nigh-on impossible for me to scale and take the battlements. Our "house rule" which allowed me to use my hand-weapon and shield (and therefore still get a 5+ save) no doubt contributed to that. So all in all - I won, but I'm not sure I deserved to win (at least not as easily as it felt like I did). The Report is Copyright (c) 2009 Dean Kelly. All rights reserved. The Report by Dean Kelly is licensed under a Creative Commons Attribution-Non-Commercial-No Derivative Works 3.0 Unported License. Component (c) Lynx7725 2009. All rights reserved. Component by Lynx7725 is licensed under a Creative Commons Attribution-Non-Commercial-Share Alike 3.0 Unported License. Component is Copyright (c) 2009 Tom Wright. All rights reserved. Component by Tom Wright is licensed under a Creative Commons Attribution-Non-Commercial-Share Alike 3.0 Unported License.